For most of us, being our own boss has a definite allure. Choosing our own hours, staff and products certainly seems tempting but in the cut-throat world of business, there are some important lessons to be learned… The daily grind of an office job in the 1980s drove American Kathleen Murphy to become a successful business entrepreneur. Bored and distracted by the daily task of producing and matching up piles of letters and envelopes, she dreamed up an alternative to the monotonous task using new computer technology to print it all together. Kathleen invented the one-piece mailer but was soon to discover the challenging world of business. Telling her story of how she got into the market, Kathleen looks back at the trials, tribulations and downright cheating she suffered at the hands of greedy firms who wanted to exploit her and her product. Since then, Kathleen has succeeded in various business ventures and has written How to Win in Business as a guide to those setting out on their own business careers. 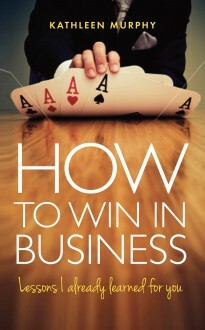 With all the lessons Kathleen has learned throughout her career, How to Win in Business is the perfect companion to help you succeed in the world of business.